We received a copy of Transformers Rescue Bots: Heroes on the Scene to watch and review. Here are our thoughts. Transformers Rescue Bots was one of the first cartoons that my daughter and I bonded over. The Rescue Bot Version of Optimus Prime was Eva’s first Transformers followed closely by Arcee from Transformers Prime. While she enjoyed Prime once in a while when the stories were about Miko and they weren’t too scary, she has continued to hold a place in her heart for the Rescue Bots. These are fun stories revolving around a family of first responders who handle all sorts of situations around a technologically advanced island town called Griffin Rock. They are aided in their jobs by four young Autobots, Heatwave, Chase, Blades and Boulder. The first season has been off the air for a while now and second season has begun so I am glad that we have this DVD with various episodes. What I am not impressed with is that the episodes are out of chronological order. I hope that a full season 1 DVD comes out so that we can have all episodes in order in one place. There is a through story and continuity to the series and I like my continuity. The episodes are fun ones filled with humor, references to Transformers history and have fun action scene for kids. The main character, Cody is a young boy who helps his family and the bots work together. He is very smart and wants nothing more than to help on rescue missions. Occasionally, however he needs the rescuing more often than not. It is a very good series for young kids and a great way to introduce them to the Transformers brand. Pick up Transformers Rescue Bots: Heroes On The Scene on March 18 or pre-order it from Amazon.com. Join the Autobots’ best rescue team­­- CHASE, HEATWAVE, BLADES and BOULDER —for more fun-filled adventures! 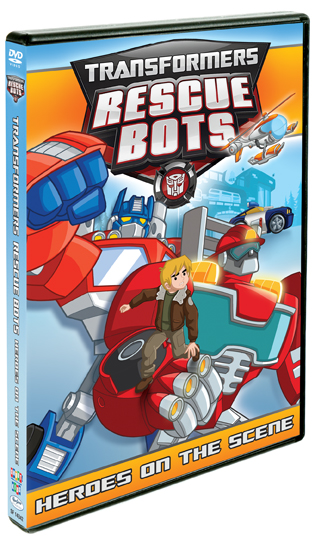 TRANSFORMERS RESCUE BOTS: Heroes on the Scene, produced by Hasbro Studios, will be released on DVD March 18th, 2014 by Shout! Factory Kids. Featuring five exciting episodes that the whole family can enjoy, this DVD is priced to own with a suggested retail price of $14.93.